I Love You Messages for Boyfriend: Guys may not be the most emotional creatures but that shouldn’t stop you from sending sweet texts to your boyfriend every now and then. No matter how cool you think you both are for mushy talk, you can never be too cool to tell him how your heart beats for him. Read this post and get inspired to write a cute message for your guy. The trick in making the puppy love in your relationship last, is to find creative ways to say I Love You. Romantic quotes in emails, posts on Facebook, funny tweets, handmade cards, flirty notes and selfies that shout I Miss You – the options are endless when you want to express your feelings to the guy who makes you go weak in the knees. 1) So far, every moment we’ve spent together has been awesome. 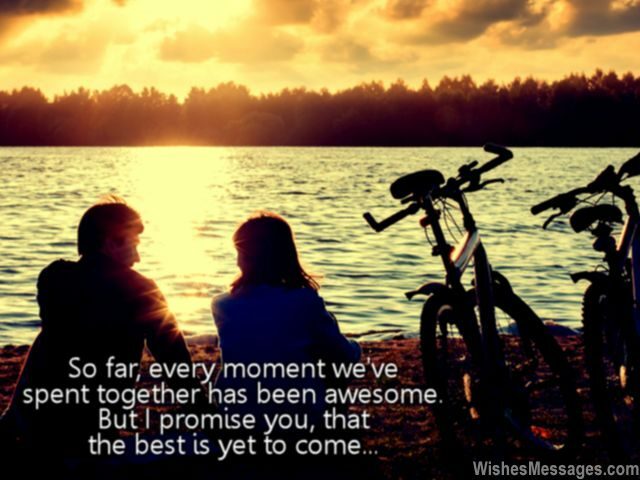 But I promise you, that the best is yet to come. I love you. 2) It is not true that love does not have boundaries. In fact, my love for you has created boundaries in your heart so that no one else can come in. I love you. 3) If you were cheese, I would be a mouse so I can nibble you bit by bit. If you were milk, I would be a cat so I can drink you sip by sip. But if you were a mouse, I would still be a cat so I can devour you piece by piece. I love you. 4) My love for you is so real, that it makes me want to do unreal things like jumping on the clouds and climbing on the rainbow. I love you. 5) Our lives are like a romantic movie played again and again. We smile, we flirt, we laugh and we fight – and we do it all over again. I love you. 6) Falling in love with you… I don’t know how or when it happened. All I know that it is the best thing to have happened to me. I love you. 7) From random laughs to random kisses, our love has put me in a blissful state of randomness that I never want to come out of. I love you. 8) If you listen to my breaths closely, you will hear the words I Love You coming out with every single one. I am literally living for you, and only you. I love you. 10) The sun can rise, the sun can set, but my day will never start until I get. A text from you, followed by a hug, and later a lot of kisses over a warm coffee mug. I love you. 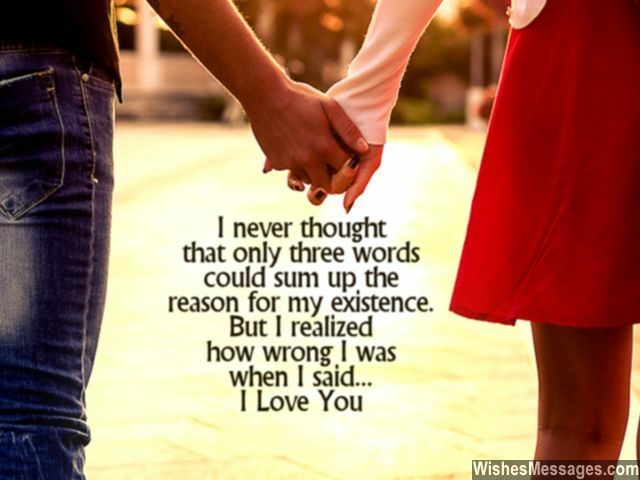 11) I never thought that only three words could sum up the reason for my existence. But I realized how wrong I was when I said… I Love You. 12) Your love is sweeter than chocolate, more intoxicating than wine and feels warmer than a fireplace in winter. In short, your love is magical. I love you. 13) It is amazing how my heart, such a tiny bit of me, can love a whole lot of you. I love you. 15) If loving you was a job, I would be the most deserving, dedicated and qualified candidate. In fact, I would even be willing to work for free. I love you. 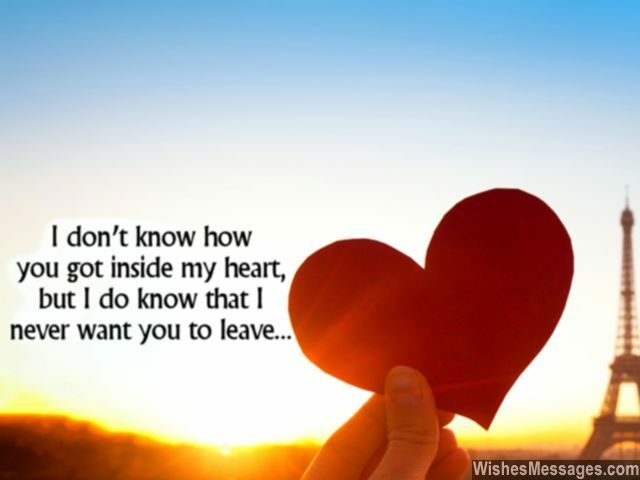 16) I don’t know how you got inside my heart, but I do know that I never want you to leave. I love you. 17) My boyfriend, that you are – then why are you so far? Your girlfriend, that I am – then why is my heart in a jam? Maybe because I miss you every single second, and our love is nothing short of a legend. I love you. 18) Loving you is not a choice or an option. It is a need and a necessity. I love you. 19) I Love You are three words that have no meaning to me whatsoever until they are either said by me to you or you to me. I love you. 20) If you ever asked me to pick between you and my dreams, I wouldn’t know what to say because being with you is my only dream. I love you. 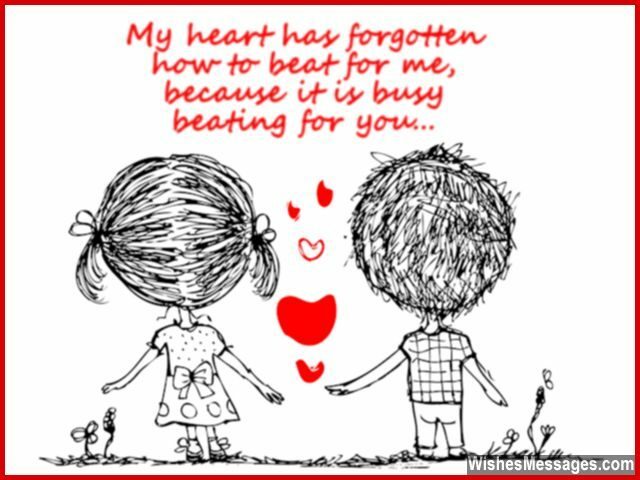 21) My heart has forgotten how to beat for me, because it is busy beating for you… I love you. 22) When you asked me out, our hearts were connected with broadband. Now that I have fallen in love with you, our hearts have a dedicated Wi-Fi connection between them. I love you. 26) Your hugs give me weak knees and your kisses make me shiver. Thinking about you makes me breathless and missing you gives me a fever. You seem to be bad for my health but that’s alright. I will still hug you, kiss you and miss you with all my might. I love you. 27) I really don’t know why people are unable to explain the definition and meaning of love. For me, love has a very simple three letter meaning – YOU. 28) I knew that I started loving you when I stopped looking for the best in you and started wishing the best for you. I love you. 29) Spending even a few hours away from you has become so difficult. I wish I could just handcuff you to myself forever. I love you sweetheart. 30) The time that we held hands for the first time was the best moment of my life… until the day I held your heart in mine. I love you. 31) A boyfriend like you is the only way to not feel blue, the only way to experience love so true and the only way to see life’s beautiful view. I love you. 32) My friends told me that falling in love would be the most beautiful feeling in the world. After I fell in love with you, I realized that even the most beautiful feeling in the world would look ugly against your love. 33) For many people, the only motto in life is to live their lives to the fullest. The motto of my life is to love you to the fullest. I love you. 34) Exciting, thrilling, exhilarating, astonishing, stimulating, elating, gripping, energizing, breathtaking, overwhelming, enchanting, riveting, enthralling, invigorating, overpowering and uplifting – this is only a tiny glimpse of how I felt when I fell in love with you. 35) A handsome guy that you are, I feel weak in the knees when I see you from far. 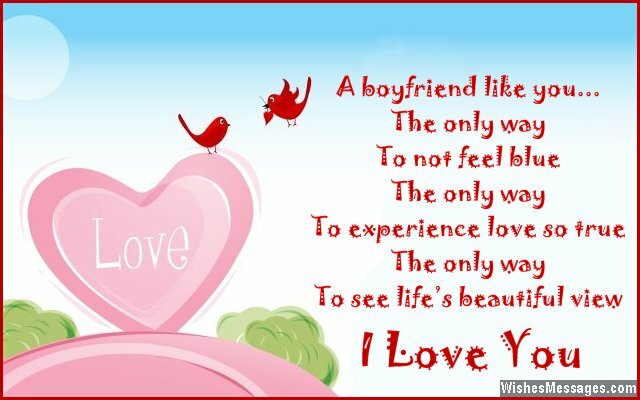 The awesome boyfriend that you are, my life’s one and only superstar. I love you. 36) I want you to know that you are the only person I ever want to be with. I would rather cry with you than laugh with anyone else because even crying with you makes me happy. I love you. 37) I think it is an insult to call you my boyfriend. You are the guy to whom I’ve submitted my mind, body and soul. I love you. 38) I love you but I also hate you because now I can’t do anything without thinking about you every single second. 39) We may be two twenty something year olds, but our deep love feels like it is centuries old. I love you.